'Bigfoot' has been a name synonomous with the Pacific Northwest. For over a century now, sightings have been reported periodically and numerous articles have been written about this huge creature with discussions as to its authenticity. 'Bigfoot' has been described as a two-legged, ape-like creature, somewhere between seven to eight feet tall and having thick dark brown fur covering its body. Now, I have the real story! There is such an ape-like creature! 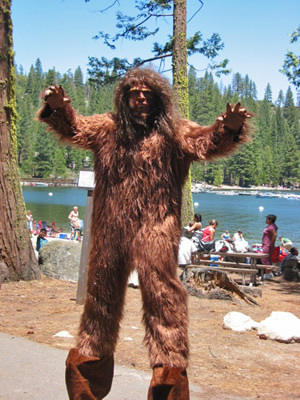 'Bigfoot' was seen at the Pinecrest Beach over the Memorial Day Weekend of 2009. Fortunately for all of us, it seemed to be very friendly and many were able to take pictures of this giant beast. I was told it especially likes to visit the Strawberry Store and does so each year over the Memorial Day weekend. Bigfoot also enjoys strolling around the beach area at Pinecrest. So, now you too know where to find Bigfoot next year! Directions: At the Summit Ranger Station along Hwy 108, take the right turn following the sign to Pinecrest. Continue straight ahead to the beach. Good luck in finding this creature next year.